New Set Of Clothes: After years of planning, the A-4E got new paint just before our Airshow in 2001 and it was worth the wait! 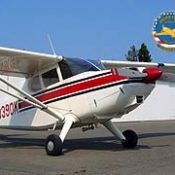 A generous donation of time and materials from Hawley´s Paint gave our Skyhawk this beautiful makeover. 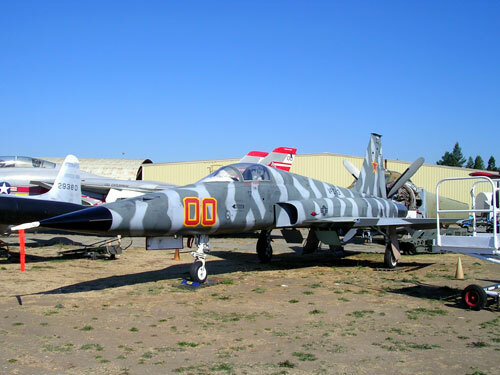 Though it looks like a fighter plane, the A-4 is a subsonic light attack aircraft. The Navy used them extensively in Vietnam. The Museum's example is loaded with correct but inert ordnance. The Douglas A-4 was designed by the famed Ed Heinemann. He created a simple, lightweight, and remarkably good-flying aircraft, which pilots loved. 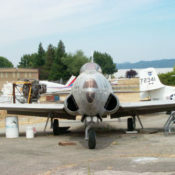 The Skyhawk was affectionately nicknamed "Scooter", "Bantam Bomber", and "Heinemann's Hot-Rod". 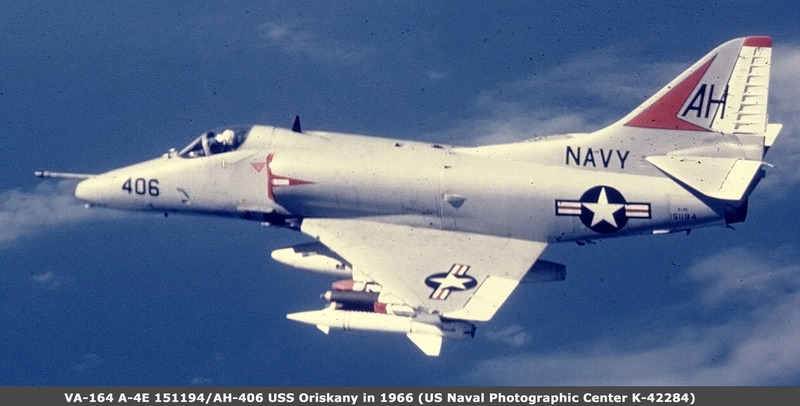 This is the Museum's A-4 Skyhawk in flight back in 1966 when it was flying with VA-164 from the USS Oriskany (CV-34). 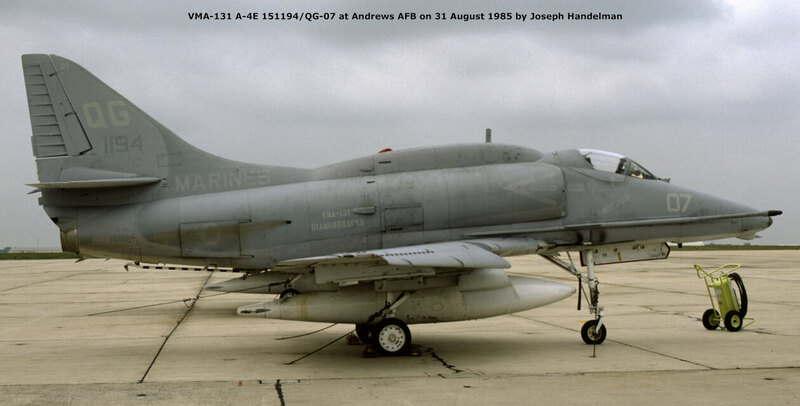 This is the Museum's A-4E Skyhawk in 1985 at Andrews Air Force Base. Note the hump on its back, which was not there in the prior photo from 1966. 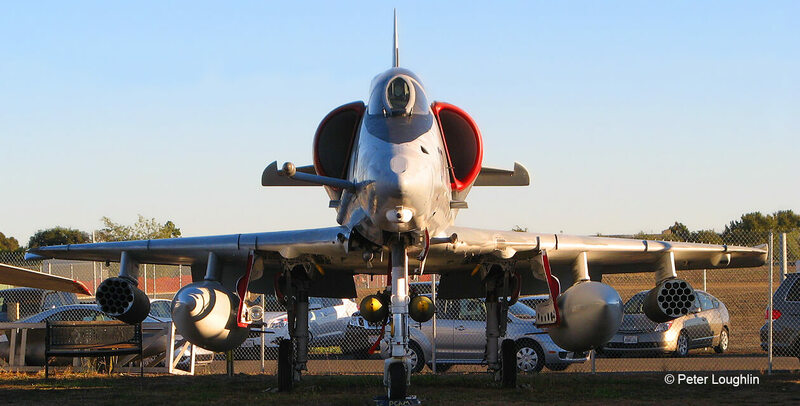 This was a later addition, installed on many A-4s during upgrade cycles to house additional avionics. 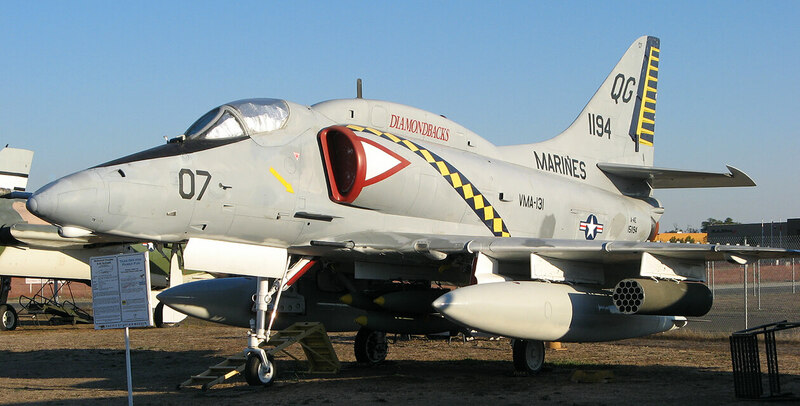 The Douglas A-4 Skyhawk is a single seat subsonic carrier-capable attack aircraft developed for the United States Navy and United States Marine Corps in the early 1950s. The delta winged, single turbojet engined Skyhawk was designed and produced by Douglas Aircraft Company, and later by McDonnell Douglas. 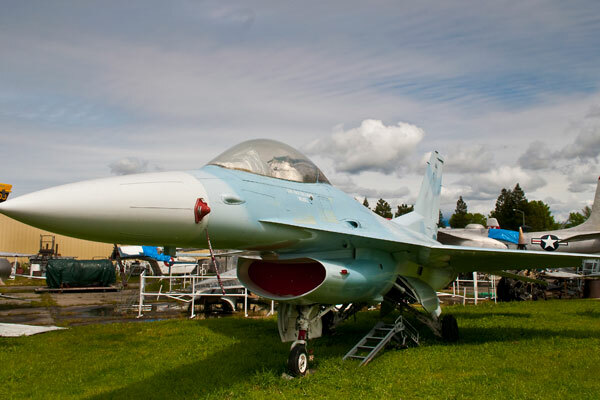 It was originally designated A4D under the U.S. Navy's pre-1962 designation system. The Skyhawk is a relatively lightweight aircraft with a maximum takeoff weight of 24,500 pounds (11,100 kg) and has a top speed of more than 670 miles per hour (1,080 km/h). The aircraft's five hardpoints support a variety of missiles, bombs and other munitions. 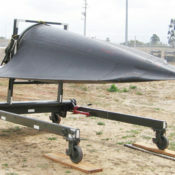 It was capable of carrying a bomb load equivalent to that of a World War II-era Boeing B-17 bomber, and could deliver nuclear weapons using a low altitude bombing system and a "loft" delivery technique. The A-4 was originally powered by the Wright J65 turbojet engine; from the A-4E onwards, the Pratt & Whitney J52 was used. 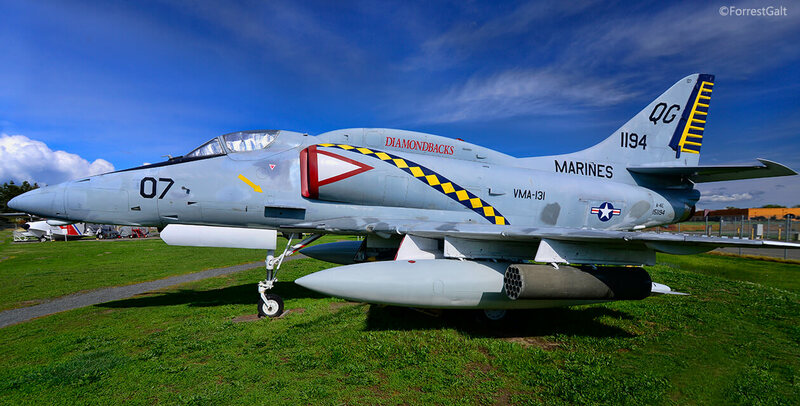 Skyhawks played key roles in the Vietnam War, the Yom Kippur War, and the Falklands War. 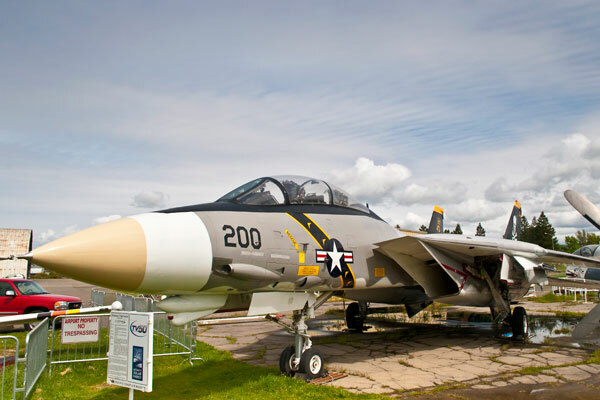 Sixty years after the aircraft's first flight, some of the nearly 3,000 produced remain in service with several air arms around the world, including from the Brazilian Navy's aircraft carrier, São Paulo. Note: Aggressor squadron markings on top of vertical stabilizer, Red Star. Note: "VMA-131" on aircraft - not listed above. Disposable: This is carried on one under fuselage hardpoint, rated at 3,500 lb (1,588 kg), and on four underwing hardpoints, the inner pair each rated at 2,250 lb (1,021 kg) and the outer pair each at 1,000 lb (454 kg); a great variety of weapon loads can be carried, including nuclear bombs, the Mk 84 2,000 lb (907 kg) bomb, the Mk 83 1,000 lb (454kg) free-fall or retarded bomb, the Mk 82 500 lb (227 kg) free-fall or retarded bomb, the Mk 81 250 lb (113 kg) free-fall or retarded bomb, the LAU-3/A launcher with 19 2.75 inch (69.85mm) rockets, the LAU-10/A launcher with four 5 inch (127mm) rockets. Communication and navigation equipment, plus Bendix automatic flight control, Marconi AN/AVQ-24 head-up display, Texas Instruments AN/AJB-3 bombing system, ANIASN-41 navigation computer, AN/APN153(V) radar navigation, and electronic countermeasures.